I recently collaborated with Cuprinol to create my very own workshop shed and I was definitley not going to turn this chance down. I have been dreaming of owning my own weaving workshop shed for quite some time now. I weave from my living room so it has been lovely to create a space specifically for this purpose and cannot wait to create so many beautiful weaves from there. 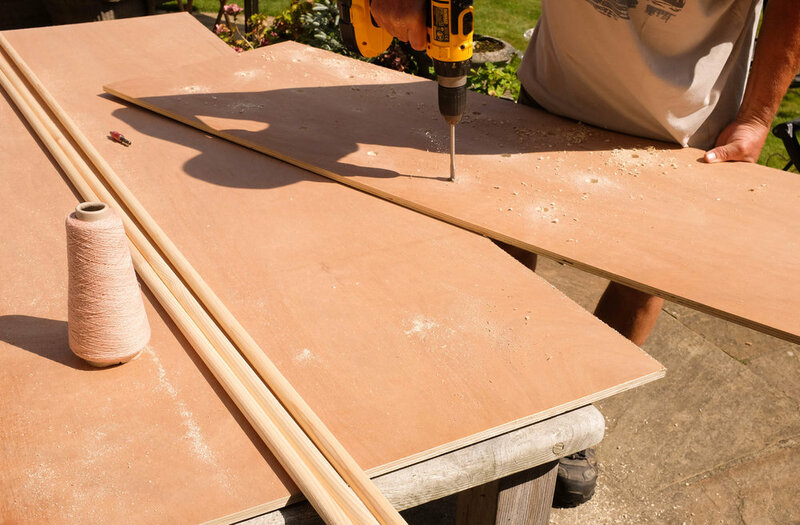 Here’s how the build process went and the idea behind the shed came about. Following the instructions from the B & Q shed, it went up in no time. There were 4 of us all working on the structure at the same time which made things so much easier and faster and I wouldn’t have been able to do it without their help. Thanks Mum, Dad and Laurie. Once we had assembled the main structure we decided the next step would be to paint the walls. This was when I could see it really taking shape and the excitement rose. It was becoming a workshop shed and I couldn’t wait to get all my weaving bits inside. I used the Cuprinol Garden Shades paint in Urban Slate for the outside and White Daisy for the interior. Cuprinol recommend using 2 coats for the best quality but I was happy with one for the Urban Slate on the outside and it dried pretty quick in the baking hot sun we were having that weekend. Inside needed two coats and it made the inside so bright, perfect for workshop conditions. They also complimented each other so well. With a little help from my Dad and his endless supply of power tools I was able to make a daybed, a desk and a peg board. All out of one piece of plywood! I made the daybed to measure a floor mattress that I had bought from Urban Outfitters. It was a lovely raspberry velvet and was a treat to lie on. The desk was made the same way but with longer hairpin legs. The peg board was slightly trickier, I marked out where the pegs would be and my Dad drilled the holes. I glued the pieces of dowelling into the holes and let it set for a few hours. This would be perfect for hanging my cones of wool next to the desk. These were all pretty simple to make and cheap. Once I had worked out exactly what I wanted to go in the shed I laid it all out on the grass first. I didn’t really know where to start. It looked great alongside the dove cot made by my Dad. I purposely put the shed next to the dove cot as I think it would be lovely to see all the birds flying around whilst sat in my shed. 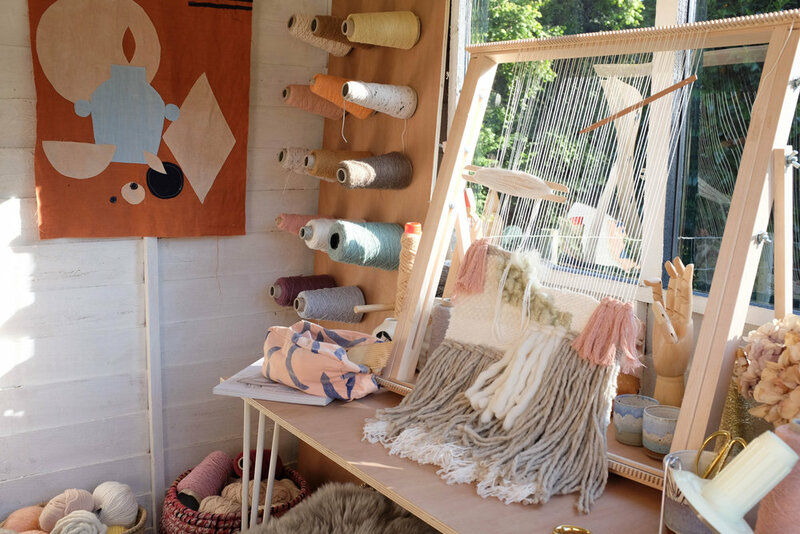 I wanted to include lots of handmade elements in the shed, including a hand sewn cushion made by my Grandma, hand knitted cushion made by my Mum, weaving looms made by my Dad (which I teach weaving workshops on) and a shibori quilt I put together using pieces of fabric my Sister and I had made. I come from a very creative family so was it really special to be able to put all these pieces together in one place. I chose to base my shed on the ‘Pullman’ shed (see below) from the workshop category on Shed of the Year because I loved his theory of when he is done with it, it must be passed on to the next person for creative purposes. I loved how I could take this concept and recreate it in my own way by using it to house all my favourite handmade belongings from family members. A reminder of where I get my love of craft and my skills from and to pass them on when I can either in my own workshops or to other loved ones. My favourite spot is right here. 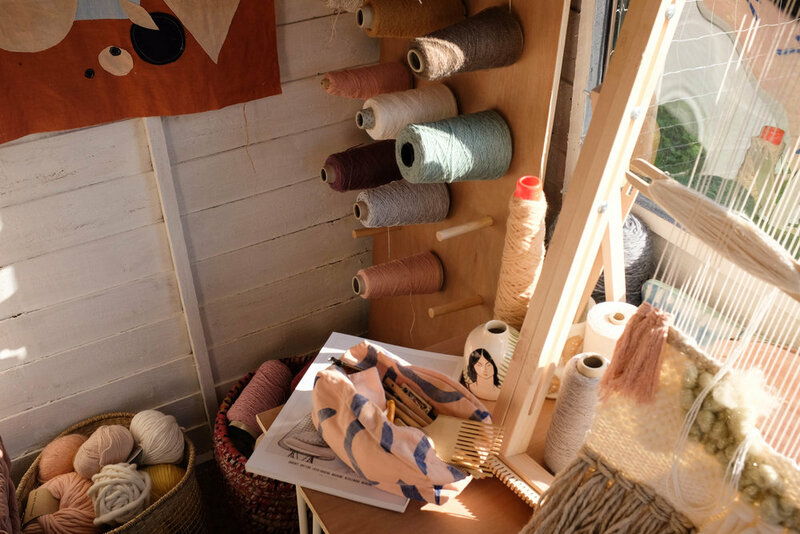 Once all my pieces were in it was such a delight to sit and weave, being inspired by all the creations in the shed. I love how the light catches on all the bits and pieces I have in the shed. Continuously highlighting parts of it throughout the day and constantly changing. Especially how the dark grey really comes out in the warm sunshine. I could have photographed the same shot over and over. Large piece of ply wood. Thank you to Cuprinol and Dulux for letting me create my dream space in conjunction with Shed of the Year. This is a sponsored post.